History: (Marvel Zombies vs Army of Darkness I#5 - BTS) - Earth-7085 was plagued by a lycanthropy virus, which also claimed many members of the superhero community. Among its victims were Spider-Man (Peter Parker) and a number of Avengers. The bloodthirsty superpowered werewolves began to feed on the general population. 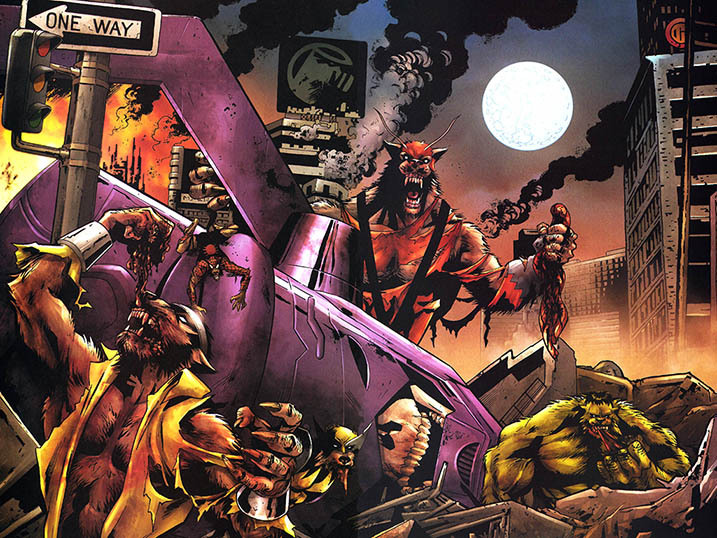 When Galactus arrived on Earth, he was attacked by the werewolf "heroes," who tore the devourer of worlds to shreds. In the aftermath, nothing but his giant skeleton was left. (Marvel Zombies vs Army of Darkness I#5) - Earth-818793's Ashley J. Williams arrived on Earth-7085 when he used Doom's interdimensional portal to escape from a zombie-infested alternate Earth. Hoping he would finally be safe, he quickly realized he'd come to yet another Earth ruled by bloodthirsty monsters. Thanks to their heightened senses, Spider-Man and his fellow werewolf "heroes" picked up on his arrival and attacked this "fresh meat," forcing Williams to run away once again. (Amazing Spider-Man III#9/2) - The Spider-Man of Earth-7085 was one of the multiverse's many Spider-Totems observed by the Master Weaver. Comments: Created by John Layman (writer), Fabiano Neves, Fernando Blanco and Sean Phillips (pencils, inks). Only Wolverine's codename was ever mentioned as "Werewolverine." 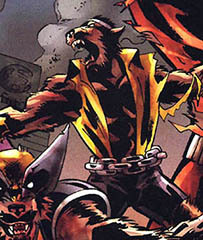 With that in mind, the other were-ified heroes might have codenames like Werewidow or Black Lupine, Cap Wolf, Giant-Wolf, Werehulk, Luke Canine and Spider-Wolf. Black Widow was one of the former heroes who contracted the lycanthropy virus and joined her fellow werewolves in feeding on the general population of Earth-7085. After devouring Galactus they went after Earth-818793's Ashley J. Williams. 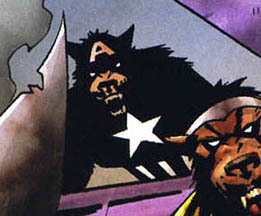 Captain America was one of the former heroes who contracted the lycanthropy virus and joined his fellow werewolves in feeding on the general population of Earth-7085. After devouring Galactus they went after Earth-818793's Ashley J. Williams. 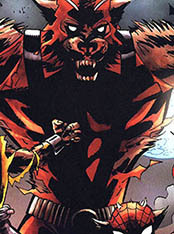 Giant-Man was one of the former heroes who contracted the lycanthropy virus and joined his fellow werewolves in feeding on the general population of Earth-7085. After devouring Galactus they went after Earth-818793's Ashley J. Williams. 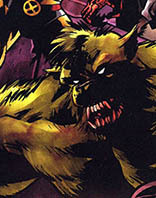 Hulk was one of the former heroes who contracted the lycanthropy virus and joined his fellow werewolves in feeding on the general population of Earth-7085. After devouring Galactus they went after Earth-818793's Ashley J. Williams. 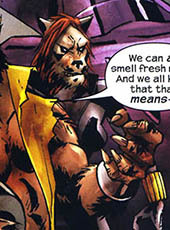 Power Man was one of the former heroes who contracted the lycanthropy virus and joined his fellow werewolves in feeding on the general population of Earth-7085. After devouring Galactus they went after Earth-818793's Ashley J. Williams. 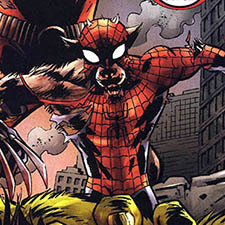 Spider-Man was one of the former heroes who contracted the lycanthropy virus and joined his fellow werewolves in feeding on the general population of Earth-7085. After devouring Galactus they went after Earth-818793's Ashley J. Williams. The Spider-Man of Earth-7085 was later one of the many alternate reality Spiders who were being watched by the Master Weaver. 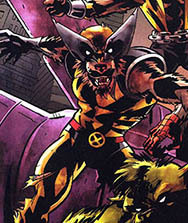 Werewolverine was one of the former heroes who contracted the lycanthropy virus and joined his fellow werewolves in feeding on the general population of Earth-7085. After devouring Galactus they went after Earth-818793's Ashley J. Williams.